Karina wants to be a doctor. 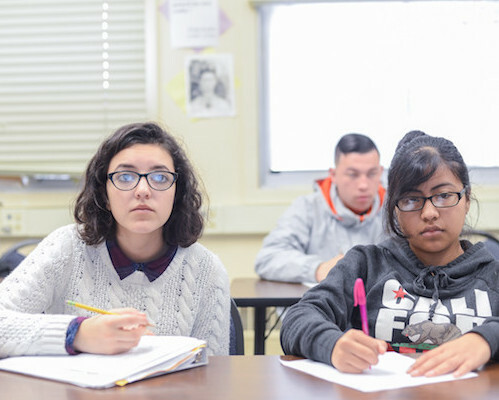 Thanks to Linked Learning, and Oakland’s Measure N, she now has a clearer path to making her dream a reality. Karina’s biology classes at Life Academy and her internship at Children’s Hospital Oakland are deeply connected and have helped the college-bound senior learn real life skills, make important connections, and learn what it is like to be a doctor. Measure N will bring more programs like this to more Oakland students. It is because of students like Karina, and our knowledge that we were not doing enough to support our students, that Oaklanders united to pass Measure N, a parcel tax that provides $12 million annually to fund these types of career pathways (Linked Learning) for students at all public high schools. GO was among the leaders in a community effort of students, educators, families, and organizations from all areas of Oakland, to pass Measure N in 2014. The community responded with an amazing 76 percent of voters supporting us. Research has shown that students with career pathways are more likely to graduate high school than their peers who do not. In Oakland, the graduation rate for students in career pathways is 84 percent compared to 69 percent without. In its first year of implementation, school-based planning teams of educators assembled and crafted plans for how to transform their schools. These teams have visited numerous other schools to learn from leaders in this area of education. We expect great things from these educators and our students in the years to come!